This article describes how to add multiple files to an article that is published to the Web (such as a Drupal Web site or Facebook). Depending on how the Web site is set up, these multiple images are displayed in a specific way. Adding multiple files is done by using the multiple-file field. It can be recognized by the "Drop your files here" text in the field and the "Add Files" button above it. Figure: The field for adding multiple files when no files have been added yet, showing the drop area (A) and the Add Files button (B). Dropping them onto the field itself. 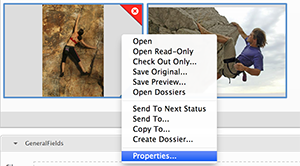 Tip: You can drop files from anywhere in Content Station such as a Dossier, the Search pane, the Elvis Application tab, or from outside of Content Station such as your Desktop. Clicking the Add Files button and browsing to where the files are located. Note: You can only browse to files that are stored in Enterprise, not to files that are stored outside of it such as those placed on your Desktop. When dropping them, they are positioned in the location where you drop them. Example: When the field already contains 2 files and you drop another 2 files between them, the newly added files are placed between the files that were already added. When using the Add Files button, they are placed at the end. Example: When the field already contains 2 files and you add another 2 files by using the Add Files button, the newly added files are placed after the files that were already added. It is very likely that the field is restricted to a maximum number of files that can be added. This maximum number is shown at the bottom right of the field, together with the number of files that are currently added. Example: When "5/10" is shown it means that 5 files have been added and that you can add no more than 10 files. When no restriction is set, you can add an unlimited number of files. When this is the case, only the number of currently added files are shown. Example: When "2" is shown it means that 2 files have been added and that you can add an unlimited number of additional files. To place a file in a different location, drag it to where you want to place it. Tip: This also works with multiple selected files. Each file comes with its own properties such as a name and a description, the location where it is saved in Enterprise, and so on. Properties that are specific to the Publication Channel to which the file is published such as format, dimensions, description, and so on. The number and type of properties vary per channel. Properties that are specific to the Enterprise workflow, such as the Brand and Issue in which it is saved, the Workflow status that has been assigned to it, and so on. The number and type of properties are usually the same for all types of files. Step 1. Hover the mouse pointer over a file. Icons appear in the corners of the thumbnail. Step 2. Click the blue Info icon in the bottom right corner. Figure: When clicking the blue info icon (A), the Properties window (B) for that file appears, showing the properties that are specific to the the Publication Channel. 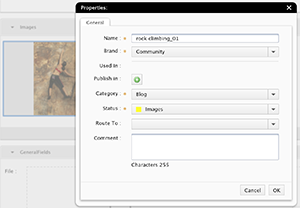 Properties that can be edited are displayed in black text; properties that cannot be edited are displayed in gray text. Step 3. Click the text of a property and make the change. Use the arrow keys (left of right) to navigate to the next file while keeping the Properties window open. Step 1. Right-click a file and choose Properties. Step 2. Make the changes and click OK to save them.